Medieval religion is an intrinsic part of our history and heritage and the architecture that resulted - from churches to abbeys, priories and cathedrals - still inspires us today, even if in ruins. 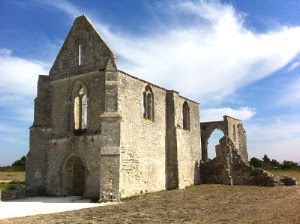 The ruins of what was once a wonderful, medieval Cistercian Abbey .... this photograph was taken on the Ile de Ré, a beautiful island off the coast of La Rochelle, France. The "Abbaye de Notre-Dame-de-Ré Les Chateliers" was founded in 1156. It was built on what at the time was a very strategic location, close to the largest docking point on the island. Described as a 'large gothic church', the Abbey flourished into the 13th and 14th centuries until devastation from the Hundred Years War took its toll. This led to structural changes and improvements in the 15th century. The ruins we see today are therefore a mixture of 12th, 13th and 15th century French medieval architecture. It makes for fascinating study when compared to medieval abbeys in England such as Hexham Abbey (refounded as an Augustinian priory in the early 12th century).